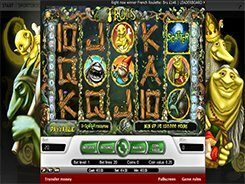 Hall of Gods is a NetEnt-powered video slot with three progressive jackpots. The largest one called Mega is hit about twice a year and its average amount exceeds $5 million. Other progressives known as Midi and Mini are less in size, but they are won more often. 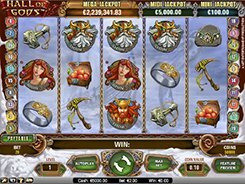 Themed around a Norse mythology, the slot is played over 5 reels and 20 fixed paylines. You can adjust a coin value from a penny to $0.5 and the number of coins per line (1 to 5). 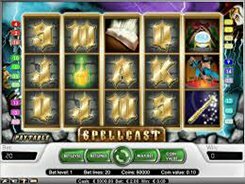 To be in with the chance of winning any of the three progressives, you need to gain access to the Bonus game first which is activated by hitting three Bonus symbols on an active payline. If this happens, you will be taken to the second screen where you are to smash shields with your hammer to reveal the hidden awards. 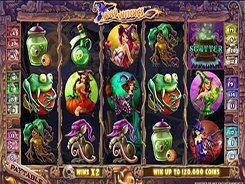 Your task is to keep picking until you match three cash amounts or three jackpot symbols. 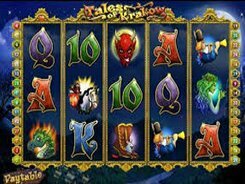 Besides, Hall of Gods features a wild symbol that expands to cover three symbol positions when landed on reels 2, 3 and 4. 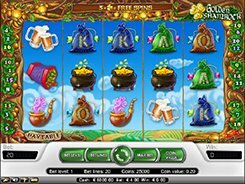 Furthermore, you can benefit from up to 20 retriggerable free spins with all payouts tripled.